I watched Maya The Bee animated series when I was a kid. It is nice to see that the stories about funny and shiny little bee are back and our children can enjoy them. Maya The Bee 2: The Honey Games is based on the well-known children’s novel and popular animated series in Europe, Australia and Asia and offers a captivating cinematic adventure into a spectacular minuscule world. After a slow harvest season, the very survival of the hive is threatened. Maya, and her sidekick, Willy, go to Buzztropolis, where the Empress invites them to participate in the Honey Games. But if they lose, the hive will have to give the Empress of f Buzztropolis all of their summer honey! Needless to say, Maya and Willy’s teammates are neither enthusiastic nor athletic, but Maya remains positive and exclaims that “every bug has a talent!” All teams accepted to the Honey Game want to win. While some teams are athletic and trained long before the game, other show great team work and even supported by the organizers of the competition, Maya and her team have to learn everything on the go. Can Maya and Team Poppy win and secure her hive’s future? Only if Maya is able to gain new friends and learn about teamwork, accountability, and overcoming preconceived notions! Bees are very organized creatures, they have to be like one team not only for completion game but every single day of their life. Team Poppy that was built by Maya, was not only bees but also ants, a spider and other bugs. They were able to identify own talents and use them to compete successfully in the Honey Games. Is it nectar fight or a maze, Team Poppy learns to be one team and support each other. Besides athletic challenges, Maya and her friends have to deal with mean and vicious competitors. Violet, a lovely purple-haired bee presenting Buzztropolis team, tries to do everything to win using sometimes not so honest tactics. She knows that Willy likes her and that Maya never participated in the games before. While Violet is very successful in her attempts, she finally realizes that the Honey Games, the trophy and victory are more important to her dad than her. A must-have for fans of all ages, the film is an instant classic that delivers wholesome family entertainment— emphasizing the value of friendship, responsibility and courage. Everyone learns important life lessons from Maya to the Empress. The movie offers colorful and bright animated features, you will dive into the world of beautiful flowers, green plants and tiny buzzing creatures. Maya The Bee 2: The Honey Games makes its buzz worthy debut on DVD and Blu-ray on May 1, 2018 from Shout! Factory Kids. To celebrate the release we are excited to give away a copy of Maya The Bee 2: The Honey Games to one our lucky reader. The giveaway is open to US and Canadian residents & ends May 4, 2018. Hi,I would like to win Maya The Bee 2: The Honey Games movie for, my granddaughter,thanks for the chance! I'd like to win for my niece's little girls. They'd love to get the Maya The Bee movie. 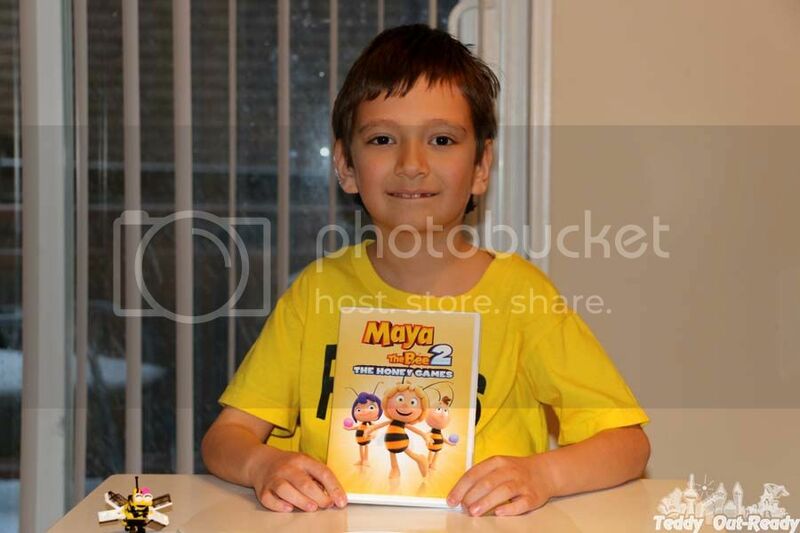 I'd like to win Maya The Bee 2: The Honey Games movie for my nephews. I would love to win this super cute movie for my nephew. He loves all things bees. I would love to win this for my kids. They have watched the first one a hundred times. Thank you! I'd like to win this movie for my kids! I would love to give this to my kids. Tantamount to the expense of film tickets, watch series this is a superior decision to watch movies at the solace of your home. You may even discover excellent movies from the choice of movies accessible from these sites.